Last week, the book received it’s 50th five star review on Amazon.com. Overall, the book has received 53 reviews on Amazon.com and 61 across all Amazon sites, 57 of which are five stars. To say that this is cool to me and that this means something to me, is an understatement. When you put something out there, you never really know how it’s going to be received. Writing a book that you truly invest of yourself into is like putting yourself out there to be judged. 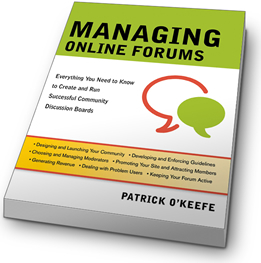 “Managing Online Forums” is my experience and my passion for online community and that it has been so well received is an incredible, wonderful thing to me. I would like to take a moment to thank everyone who has taken the time to digest the book and honestly review it. Regardless of the end determination, whether you liked it or not, I appreciate everyone who takes the act of reviewing as serious as it is. Thank you. Thank you to everyone who worked on the book and everyone who has been supportive of it. This is a large number of people, but the vast majority are listed in the book’s acknowledgments. Last, but not least, thank you to everyone who has bought the book and spread the word about it. I see pretty much every mention and it is a simple bit of happiness when I see that someone has mentioned my work. I really appreciate it.